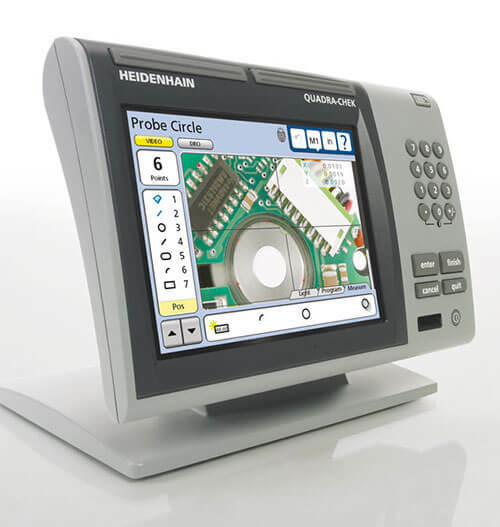 The new QUADRA-CHEK® ND 1300 digital readout (DRO) – especially designed for convenient 2-D measurement and featuring a cutting-edge video system – is now available exclusively through the global distribution network of HEIDENHAIN Corporation. Previously known and sold by the HEIDENHAIN subsidiary, METRONICS, Inc., QUADRA-CHEK DROs continue to hold a top spot when supporting gauging systems. Since 1983, METRONICS has been active in the metrology market with coordinate measuring machines, profile projectors, tool presetters and measuring microscopes. HEIDENHAIN Corporation has recently undergone successful consolidation efforts and now markets past METRONICS products. The newest ND 1300 QUADRA-CHEK (one of five of the current HEIDENHAIN QUADRA-CHEK families) sports a new dark gray faceplate while maintaining all the great features of the recent past, including the QUADRA-CHEK brand name. Benefitting from the considerable resources of HEIDENHAIN Corporation, QUADRA-CHEK customers will experience vastly expanded sales, service and technical support. Purchasers of the new ND 1300 DRO can expect a high quality gauging workhorse with support of up to four axes. The ND 1300 QUADRA-CHEK digital readout also features an enhanced color touch-screen interface and patented Measure Magic® technology. With its offered optical and video edge detection systems, the ND 1300 is ideal for measuring microscopes, optical comparators, and video systems. All ND 1300 series models include serial and USB ports for use with printers and networks. The ND 1300 video option enables video cameras with S-Video or composite interfaces to connect simply, making past requirements of a connected PC with a frame grabber or monitor with crosshair generator unnecessary. HEIDENHAIN now also offers the GAGE-CHECK model ND 2100G (past METRONICS GC-100) designed for multipoint measurement with inputs for up to eight gages.